A judge Tuesday found a homeless man competent to stand trial in the kidnapping of teenager Elizabeth Smart, after the man's lawyers decided not to contest the issue. The decision swiftly ended what had been expected to be a three-day hearing to gauge Brian Mitchell's mental state. The 50-year-old Mitchell, handcuffed and sporting a shaggy gray and black beard, did not speak but nodded twice when Judge Judith Atherton asked if he agreed with the decision and understood what it meant. Salt Lake County District Attorney David Yocom said he and lead defense attorney Kim Clark had been in negotiations over waiving the competency hearing. Yocom would not say whether there were plea negotiations under way. Clark said the move not to contest competency was a tactical decision reached after the judge ruled the competency hearing would be open. The defense had sought to close it, arguing media reports concerning Mitchell's mental state would taint the jury pool if he were found competent. Mitchell and his wife, Wanda Barzee, 58, are charged with kidnapping Smart from her bedroom at knifepoint in 2002, and keeping her for nine months. She was 14 when she was abducted. The two face kidnapping, aggravated sexual assault, aggravated burglary and attempted aggravated kidnapping charges. The couple has been in custody since the teenager was found with them in March 2003. 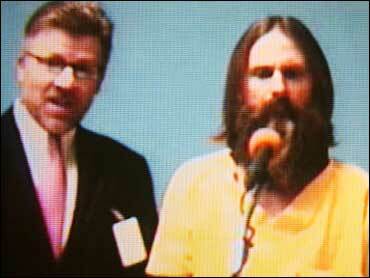 Barzee has been twice deemed incompetent to stand trial and is undergoing treatment at a state mental hospital. She is scheduled to be re-evaluated in August 2005. Mitchell, who describes himself as a prophet, was allegedly motivated to detain Elizabeth by a "revelation from God," according to court documents. Authorities say Mitchell had written a rambling manifesto espousing the virtues of polygamy and may have taken the teen to make her his second wife. Two court-appointed experts apparently could not agree on the issue of his competency. Mitchell had refused to cooperate with them, so they reached their conclusions by talking to Mitchell's friends and family. The evaluators did agree he suffers from a narcissistic delusion. Legal incompetence means a person is prevented by mental illness or other ailment from understanding the charges against them or aiding in their defense.